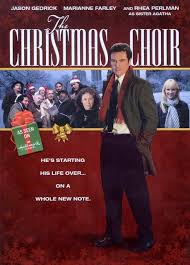 The Christmas Choir (2008) Rated NR | What to Watch. Dumped by his fiancée before Christmas, an accountant meets a homeless man who teaches him what’s important in life. Starring Jason Gedrick, Tyrone Benskin, Michael Sarrazin, Marianne Farley, Rhea Perlman. A pleasant change of pace for the season, this film actually focuses on one of the true meanings of Christmas: giving back. It isn’t a high quality production, but its value can be found in the richness of the message, as each of the characters a particular struggle to work through. We see the sweetness of Christmas in the changed lives, as these people become who they were truly meant to be. For the positive message alone, I say this one is worth a watch. This entry was posted in 2008, Canadian Films, Christmas Films, Drama, films, hallmark movies, Movie reviews, movies, Rated NR, reviews and tagged accountant, character, Christmas, christmas film, christmas films, christmas movie, christmas movies, fiancee, film, film reviews, films, Homeless, human, Jason Gedrick, life, man, Marianne Farley, Michael Sarrazin, movie, movie reviews, movies, Rhea Perlman, season, story, The Christmas Choir, trailer, Tyrone Benskin, worth. Bookmark the permalink.